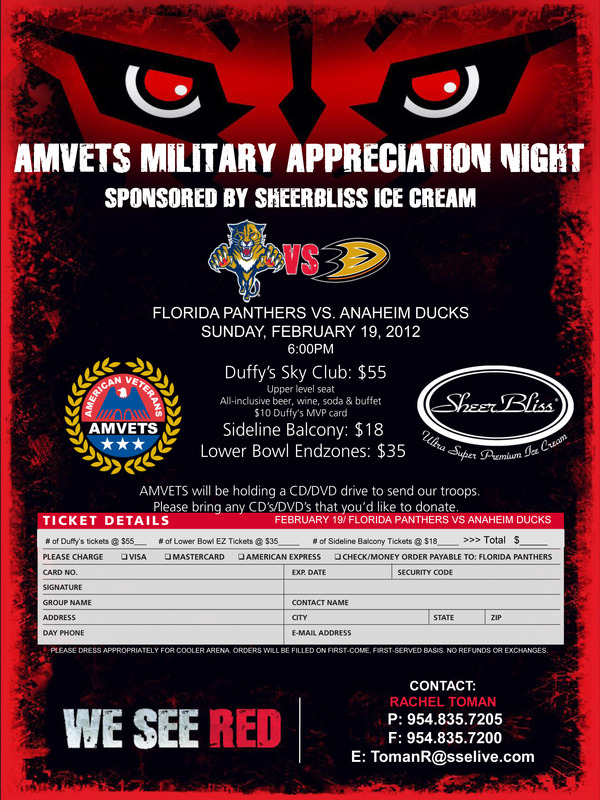 Sheerbliss Ice Cream and BankAtlantic will host AMVETS Military Appreciation Night as the Florida Panthers take on the Anaheim Ducks Feb. 19 at the BankAtlantic Center in Miami. Take advantage of fantastic pricing for veterans, and catch National Cmdr. Gary L. Fry’s special presentation at center ice. Be sure to bring DVDs for the troops and look for AMVETS Taskforce DVD collection boxes at the BankAtlantic Center. For information about AMVETS Military Appreciation Night ticket sales, pricing and availability, contact Rachel Toman at tomanr@sselive.com or phone: 954 835-7205.